For decades Michel Michelet (1894-1995) was known in Hollywood as a leading film composer, responsible for more than a hundred film scores, including some of the classic film noir soundtracks of the 1940s and 1950s. What his movie music fans did not know was that the apparent Frenchman was actually a Jew from Kiev, born Mikhail Isaakovich Levin. Furthermore, this self-professed “Russian-French-American” composed one of the great Jewish piano quintets of the twentieth century. 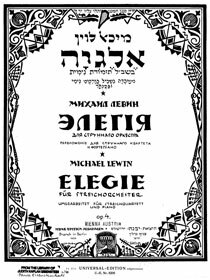 As a young man, Michelet moved to Germany in 1912 to study cello with Julius Klengel and composition with Max Reger at the Leipzig Conservatory before returning to Russia shortly before World War I. He subsequently studied composition with Reinhold Gliere in Kiev, and then served as a professor first at the Kiev Conservatory – from 1919 to 1921 – and then at the Vienna Conservatory. Michelet settled in Paris in 1924 where he lived for the seventeen years. He and his wife fled the Nazis in 1942, escaping to the United States and settling in Los Angeles the same year.